Retractors are used to hold an incision or wound open while a surgeon works. The retractor could also be used to hold tissues or organs out of the way during a surgery. 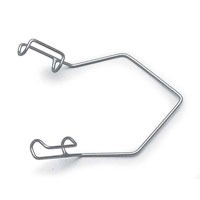 Wire retractors are the simplest style of retractor. Usually the wire has some spring so that the surgeon can pinch it together, position it and release it. These also free up the surgeon's hands.